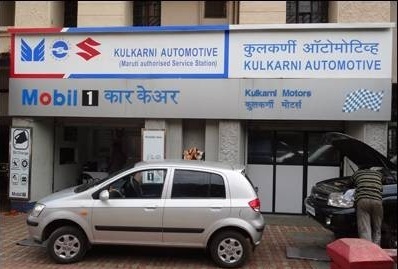 I recently had my car’s servicing done at Kulkarni Automotive, Viman Nagar, Pune. Sharing my personal experience. I was initially skeptical to approach a local authorized Maruti service station as I had always went to bigger Maruti workshops for 8 years, but Kulkarni proved my decision right. One of my friend had recommended Kulkarni service station at Viman Nagar and he proved right too. They serviced my car and I was a happy customer in the end. It was a regular car service that made me feel good but what worried me was that the car security remote was not working. It was definitely working in the morning when I handed over my car to them but was not working in the evening. Mr Rajendra Kumar, Site Manager, was reluctant in accepting (in the beginning) that the remote went down while the car was in service but asked couple of workers to have a look but in vain. We had a discussion as I could not bear the cost with no fault of mine. He was still reluctant and asked a professional from Autocop to see if the remote can be repaired. After my continual adamant gesture that the remote broke down their, he agreed to bear 50% of the cost. I okayed it thinking it being an electrical thing that could end at any point in time. Although I was not completely happy about being bearing 50% but could not do much. He also tried his level best to get remote working. The professional who came to see the remote also gave up and said a new remote is the only option. No worries about that, I took the money and came back. Rajendra was first in offering me cash when I was not liking the deal. That way it looked good. Overall, service station was good in both ways, service wise and attitude wise.